Echuca, like Swan Hill and Mildura was a river port town in Australia's early days. Paddle steamers plyed the rivers collecting wool from farms and delivering it to one of the railheads for transportation to Melbourne for export. The tourist highlight in Echuca is the old wharf area with riverboat, warehouses and historical display. Included in the precinct is the nearby Star Hotel and Bridge Hotel. Open daily 9am to 5pm. Entry to port and old hotels is $7. Phone 54824248. Paddlesteamers leave just north of the old port of Echuca. The original steam powered PS Emmylou has 90 minutes cruises. $12. Phone 54823801. Large wetland and river redgum reserve beside the Murray River 40 kilometres northeast of Echuca, 10 kilometres from the tiny town of Barmah. 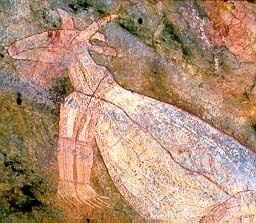 The area is an Aboriginal reserve. The Dharnya Centre has displays about their culture. There is free camping at the Barmah lakes and a few people have houseboats moored here. Houseboats are available for hire overnight or longer from Echuca. With kitchens, dining area and bedrooms, you drive these things yourself along the windy Murray River, mooring it at the riverside each night. It can be quite relaxing. House boats are often heavily booked out and quite expensive. Get together a group to go. House boats accomodate upto 8 people. Rich River 1800 032643. Dinky-Di 54825223. Magic Murray 54806099. Phone 5480 7555 or 1800 804446. Historic river port town on the Murray River. Swan Hill's top attraction. Recreation of a 1800s riverport with replica pioneer homes and paddle steamer PS Pyap which makes short cruises at 10.30am and 2.30pm. Open daily 8.30 to 5pm. Entry $12, paddle steamer cruise $8 extra. A light and sound show tracing Swan Hill's history begins one hour after sunset. Cost $8. A combined ticket to all three is $23. Childrens prices are about half. 306 Campball Street (corner of Rutherford Street) Phone 5032 3033. Warm sunny riverside town known for winemaking, dried fruit (especially sultana grapes) and citrus grown only from extensive irrigation of the surrounding arid land. This is still old riverboat country. The paddlesteamer PS Melbourne has two hour cruises for $16 (children $6). The paddlesteamer PS Avoca has lunch and dinner cruises for $27/$37. Wentworth Road, Merebin. 13 kilometres west of Mildura. Wine tasting. Guided tours of the winery are available. The winery overlooks the river. There are numerous other wineries around Mildura. Fascinating tour of a citrus farm 7 kilometres north of Mildura. Just west of town the riverboats pass through a loch. The half hour walk along the riverbank to the loch pleasant. This large old and fully restored hotel has a number of restaurants. It is undoubtedly the nicest place to eat or stay in Mildura. On the main street, Deakin Street, near the river. 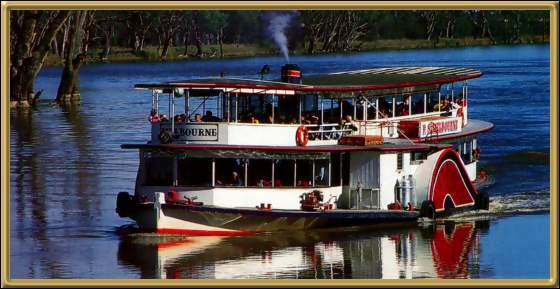 Houseboats are available for hire overnight or longer from Mildura. With kitchens, dining area and bedrooms, you drive these things yourself along the windy Murray River, mooring it at the riverside each night. It can be quite relaxing. House boats are often heavily booked out and quite expensive. Get together a group to go. Houseboats accomodate upto 12 people. There are numerous operators. Wetland park by the river 70 kilometres south of Mildura. Home to much birdlife. Old river town 30 kilometres away in New South Wales at the junction the Murray and Darling rivers. The narrow near-stagnant Darling River heads north for over one thousand kilometres through desert and arid farmland. The Darling is Australia's longest river. Post Office: Corner Deakin Avenue and Eighth Street. Coles 24 hour supermarket: Corner Lime Street and Eighth Street. Mildura Tourist Information: Corner of Deakin Avenue and Twelfth Street. Phone 1800 039043. Adelaide is west of Mildura. Bendigo on the Old Victorian Goldfields is south of Echuca. Further south is Melbourne. Following the river further east from Echuca meets the Hume Freeway at Albury. Canberra and Sydney are north from there.